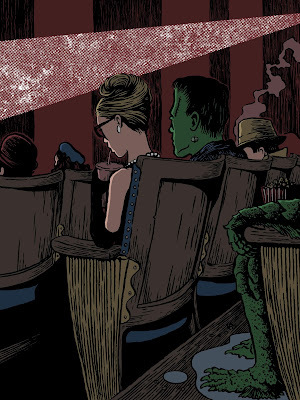 Typical: you wait months for an illustration set in an old cinema then two come at once. My latest time limited print for Off the Barrow is available now on the theme 'The Silver Screen'. I enjoyed drawing the Little White Lies piece for 'Good Bye, Dragon Inn' so much I thought I'd try it again with a nostalgic nod to some cinematic classics. Feel free to guess who's who. I went with a slightly more complex colouring style for this piece. Most of my work ends up as screen prints or linocut prints which tends to dictate less colours so it was nice to try and use a few more for a change. As before the print will be available for one month only and then never again. It's £15 unframed (including postage) and £20 with a frame so a real bargain and on top of that a percentage of profits go the MS Society. More info here.